This contribution is the first of a two-part essay by Dr. Gilles Olakounlé Yabi on the anxious environment in West African countries preparing for elections in 2014/2015. The second part will be posted on African Futures in mid-March. This essay was originally written in French and translated by African Futures. All issues of misinterpretation or mistranslation are therefore solely the editors’ responsibility. To ensure the author’s original nuance, please read the French version. It is with knotted stomachs and clenched throats that the citizens of six members of the Economic Community of West African States (ECOWAS) are preparing to enter an election period that has become synonymous in too large a part of the continent, with a high risk of violent crisis. 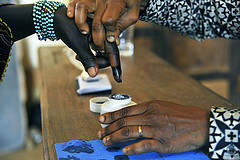 The first who will be summoned to the ballot are the voters of Guinea-Bissau, where presidential and legislative elections scheduled for 13 April are supposed to turn the page on a two-year transition period. In this Portuguese-speaking country, the only in the region except the islands of Cape Verde, the electoral calendar has been systematically disrupted since the nation’s formal democratization in the early 1990s, by military coups, political assassinations, and most recently by the natural death of the President. But it is in fact in 2015, when the election season will get exceptionally busy. Presidential elections are foreseen in the first trimester in Nigeria and in Togo, and in the last trimester in Burkina Faso, Guinea, and Côte d’Ivoire. For each of these countries, and for the whole of West Africa, presidential elections have come to represent a critical moment for peace and political stability, and consequentially for economic and social progress. If the region had not faced a series of violent crises during the past ten years, the elections set for 2014-2015 would have surely served as a test for the consolidation of the practice and culture of democracy in each of the mentioned countries and, by the same token, the whole West African region. This question will only be secondary for the citizens, as they, as well as regional and international organizations will now approach the presidential ballots very differently. The primary objective will be to prevent these moments, which were supposed to demonstrate the vitality of democracy, from turning into periods of sustained violence, or worse, armed conflict. In light of the political and security events of the past years, these fears are legitimate. But what is the magnitude of the risk associated with each of the upcoming presidential elections in the region? Where will the outcome have the most impact? To attempt to answer these questions, it is useful to consider three evaluation factors: the anticipated intensity of presidential competition, the general security context of the country, and the institutional structure put in place to manage the electoral process. Anticipating the intensity of the competition for the presidential position amounts to pondering, in each country, the likelihood that the ballot will be open, and that no candidate will be sure to win at an early stage in the process. Classifying the countries based on the first factor is not so simple, since we do not yet know with certainty who will be the candidates running in each presidential election. In Guinea-Bissau, the ballot must put an end to a special situation borne of a coup… against a prime minister who was on the verge of becoming president, Carlos Gomes Júnior. Organized in April 2012, the last election was stopped between the two rounds of balloting. Gomes Júnior, largely in the lead after the first ballot, was brutally removed and forced to leave the country by the military chiefs who were hostile toward him. The former prime minister remains an influential political actor, but is still out of the country, currently in Cape Verde after first escaping to Portugal. He is still considered unacceptable by the military hierarchy and perhaps also by important regional actors, therefore it is difficult to envision how he could safely enter his country again and run once more in the presidential election. He has sought the nomination of his party, the PAIGC (Partido Africano da Independência da Guiné e Cabo Verde), but the party chose on 2 March, a former minister of finance and former mayor of the capital, José Mário Vaz, as its presidential candidate. The PAIGC, a dominant political force in the country despite its internal divisions, should start off with a lead in the parliamentary elections over the PRS (Partido para a Renovação Social), which is also divided, and ahead of a few other smaller parties. The competition for the presidency should be more competitive due to a few independent candidates likely to attract an electorate confused by and tired of partisan political struggles. But the hardest thing in Guinea-Bissau is not always to endow the country with a democratically elected president. It’s guaranteeing his political and physical survival until the end of his term, especially if he/she came to decide to rule against the interests of military chiefs and/or big drug traffickers, active in international networks across the region. In Nigeria as well, the list of presidential candidates is not known with certainty, but attention is focused on the intentions of outgoing President Goodluck Jonathan. Evoking a non-written rotation principle between the nomination of northern and southern candidates’ to lead the PDP (People’s Democratic Party), the party in power since the return of democracy in 1999, those opposed to a second term for the president are numerous. Vice President in 2007, Jonathan inherited the presidency after the death of Umaru Yar’Adua in 2010 before getting reelected in 2011 for his first full term of four years. The defections of influential PDP personalities have multiplied in the past few months and continue to weaken the camp of the president. The opposition to PDP, on the other hand, is showing unprecedented strength, because of the merging in February 2013 of four important parties into one large opposition bloc, the APC (All Progressives Congress), which is just as established as the ruling party in each state of the federation. Financial means, a key determining factor in colossal electoral battles, will not be lacking from one camp to the next, even though the ruling party of this powerful oil-producing country will undoubtedly have at their disposal certain advantages. The competition will most likely be very intense. It will be so in all scenarios, including the improbable case of withdrawal from the race by the incumbent president for his party’s nomination, and no matter which candidate is chosen by the APC. This choice will not be easy and could produce rifts in the unity so far displayed by the new largest opposition party. The Togolese, like the Nigerians, will be going to the ballot during the first trimester of 2015. The outgoing president Faure Gnassingbé, elected during controversial and violent circumstances in 2005 after his father Eyadema Gnassingbé died of natural causes, and then again re-elected in 2010, will be able to run for a third time without modifying the current Constitution. Since the forced return to a formal democratic system, the Togolese power structures have not stopped toying with the set limitation of two consecutive presidential terms. In 2002 a constitutional revision not only deleted this provision, but also instituted the principle of a single round presidential election. Despite the recommendations of a global political agreement signed in 2006 and repeated demands from the opposition, the current constitution and the electoral law have remained very favorable towards a quiet continuation of President Gnassingbé’s regime. The presidential party UNIR (Union pour la République) controls the parliament with an absolute majority and will ensure that nothing is devised to reduce their candidate’s chances of victory in 2015. Moreover, the security apparatus of Gnassingbé’s regime and the insufficient coordination of the political opposition do not build the case, at this moment, for an open and serious electoral race that could result in a real political turnover in a country that has not experienced one since Eyadema Gnassingbé’s coup…in 1967. In Burkina Faso, there has not even been a generational change in leadership, like what was seen in Togo in 2005. In power since October 1987, Blaise Compaoré will have spent 28 years as head of state at the moment of the 2015 presidential election. The current constitution limits the number of consecutive terms to two and the president will not be able to be a candidate unless he succeeds in passing a new revision of the fundamental law in the coming months. Because his intentions became clear, opponents to any kind of maneuver to prolong the reign of President Compaoré started their mobilization in Ouagadougou. They succeeded in weakening the president’s power base faster than expected. A significant number of important personalities from his party, the CDP (Congrès pour la Démocratie et le Progrès), who used to be close supporters of Compaoré, decided to leave the ship last January and join the opponents of the constitutional revision. Burkina Faso is already in a fraught pre-electoral period, and this situation will last until the government makes the decision to either renounce the idea of a constitutional modification or choose to convene a referendum on the subject. If the latter course is chosen, vehement political protests are inevitable and their consequences uncertain. The 2015 electoral race will then be highly competitive. If Compaoré decides to not seek reelection, the field would be very open. But the environment should be less tense and volatile than if the current president insists on running again. In Guinea, President Alpha Condé is expected to run in 2015 for his second and last term. There is no legal obstacle to overcome, but he will face well-organized political contenders that are determined and capable of depriving him from a renewed term. The president came to power in December 2010 after a laborious and controversial election where, in the first ballot, the former Prime Minister Cellou Dalein Diallo had largely outdistanced him, yet he was able to overcome the deficit and win in the second round. The recent legislative elections, also organized with difficulty after repeated delays and strong international involvement, made it clear that the camp of President Condé was unable to truly dominate the opposition in the polls. The latter, which is even divided into several clusters, is almost on equal footing with the president’s party, the RPG (Rassemblement du Peuple Guinéen) and its allies. The UFDG (Union des Forces Démocratiques de Guinée) of Cellou Dalein Diallo represents an important political force that could become the majority contender in the second ballot of the presidential election, if its allies and other important parties such as the UFR (L’Union des Forces Républicaines) of Sydia Touré or PEDN (Parti de l’Espoir pour le Développement National) of Lansana Kouyaté join an “all against Condé” coalition. In the currently unlikely case of a single and formidable opposition candidate, President Condé would be exposed to a real possibility of being defeated, despite the usual advantages granted to a ruling candidate. There will be no limits to the intensity of the battle for presidency in Guinea at the end of 2015. It will be one of the toughest in the region. During this same and final trimester of 2015, Ivoirians will also be called to the ballot to re-elect the current President Alassane Ouattara or choose a new head of state. After arriving to power during the course of a competitive election that dissolved into armed conflict with the then-incumbent president, Laurent Gbagbo, Ouattara has quickly indicated that he would like to be a candidate for a second and final term. His party, the RDR (Rassemblement des Républicains), will definitely be united behind the president for the future electoral battle, but the complete and unequivocal support from the PDCI (Parti Démocratique de Côte d’Ivoire), an important and potentially decisive ally, is not yet sure. The electoral outcome is not a foregone conclusion but the weakness and liabilities of the FPI (Front Populaire Ivoirien) of former President Gbagbo, a prisoner of the ICC at The Hague, are such that the current president should start as the likely favorite. Also, his actions to boost the Ivorian economy and his recent measures towards national political reconciliation will play in his favor. We can predict a moderately intense presidential election from an electorate that has not quite recovered from the traumatic 2010 post-electoral experience. In the second part, the Dr. Yabi will consider the two other proposed evaluation factors. What can an analysis of the general security context of the various countries, and the institutional framework for the elections, tell us about the risks of post-electoral violence? The other presidential election in 2014, scheduled for June, will take place in Mauritania, a country straddling West and North Africa and removed itself from ECOWAS in 2000. At the same time, in the beginning of 2016, voters in Niger and Benin will in turn be called to the ballot to choose their president. In both countries, the political climate is already marked by great tensions and more than two years of failed elections. Cape Verde, Gambia, and Ghana are also preparing elections for the second semester of 2016.